Until the middle of the 19th century, Tebay was a hamlet which formed part of the parish of Orton. The railway came in 1846 and with the steady increase in the population, it was recognized that Tebay needed its own church. 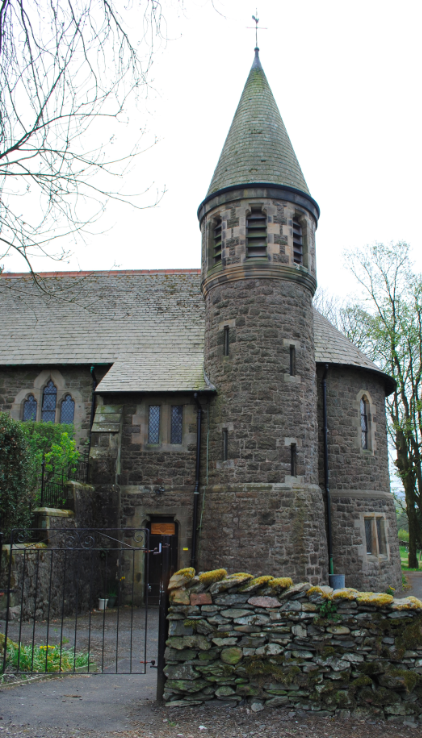 With an initiative from the Bishop of Carlisle and funds from the London & North Western Railway Company, a separate ecclesiastical parish was created. The building was completed in 1880 and was the design of architect C J Ferguson who was a pupil of the English Gothic Revival architect George Gilbert Scott. 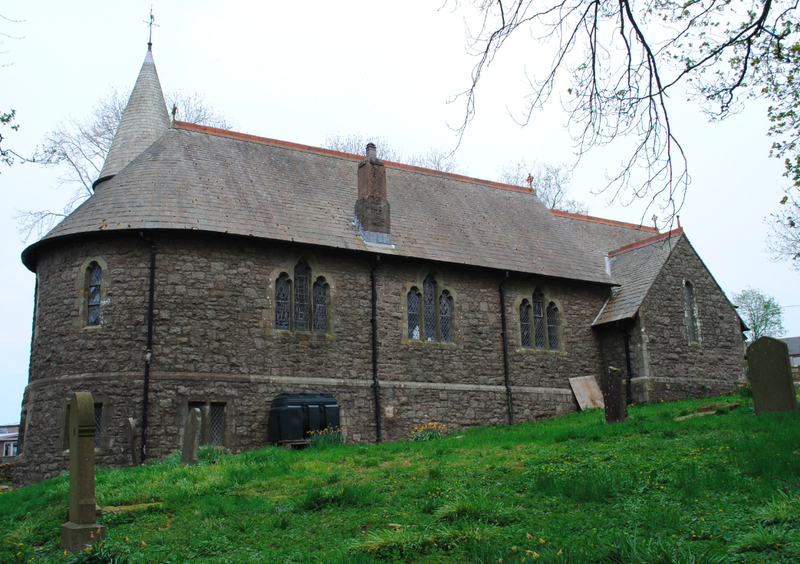 Consecrated on 20th July 1880 by Reverend Harvey Goodwin (Lord Bishop of Carlisle), the church is dedicated to Saint James – the fisherman of Galilee. The building is constructed of rock faced snecked granite blocks (Shap granite) and features a west baptistry in the form of a big apse. Next to the western baptistry is a three stage round bell turret with conical spire. March 1896 saw the arrival of Reverend A E Palin who had previously been curate in Workington, Scotby and Maryport. 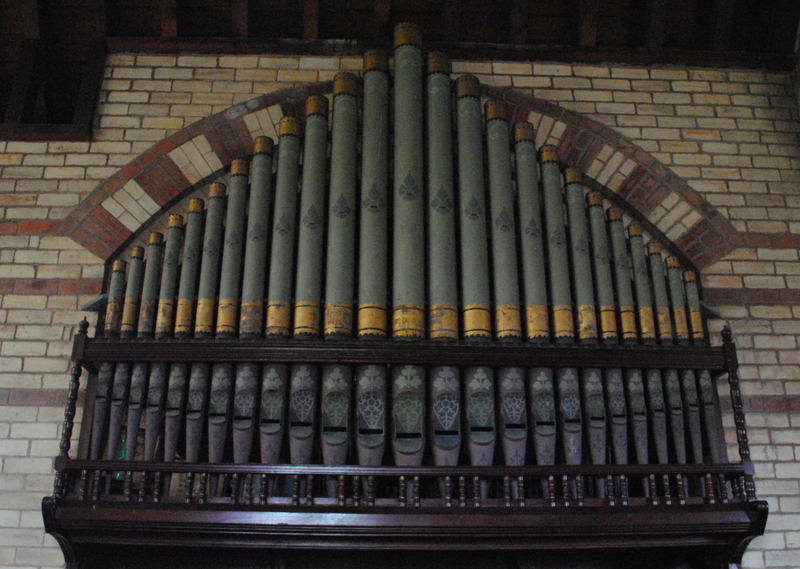 The heating system and organ were in urgent need of repairs at this time and by July of the same year, a considerable amount of funds had been raised in order to begin work. Following rebuilding work the organ was reopened on 22nd June 1898, celebrated with a Parish Supper, costing more than the original value of the instrument. 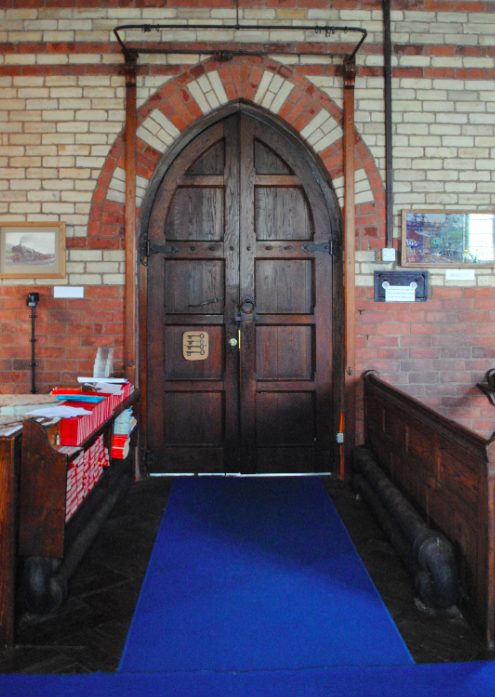 The interior of the church is brick-faced, yellow with red bands and the north plank porch door (above) sits within a pointed surround. 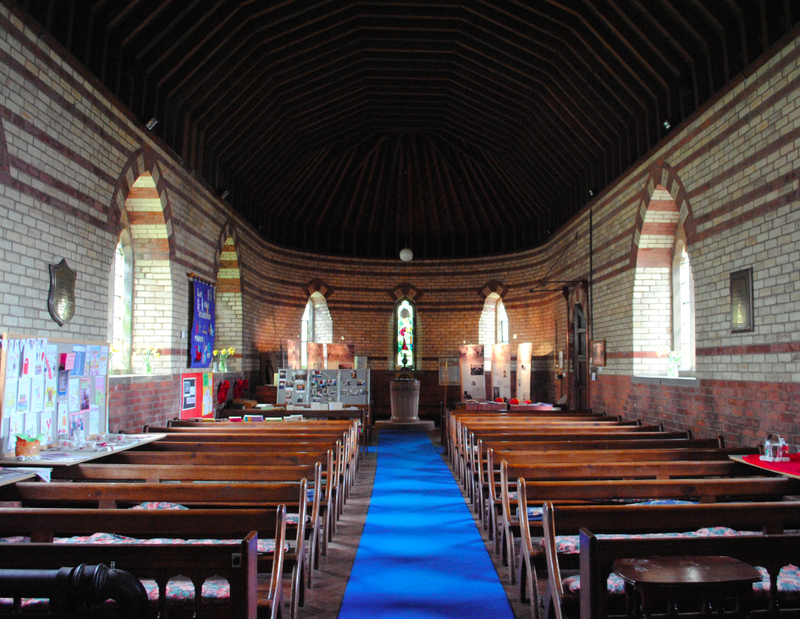 Referred to as a true railway church, the inside is built with railway bricks and features pews akin to those found in a railway waiting room. After the Reverend Arthur Aird left in 1977, Tebay was combined with Orton and was no longer a separate parish. 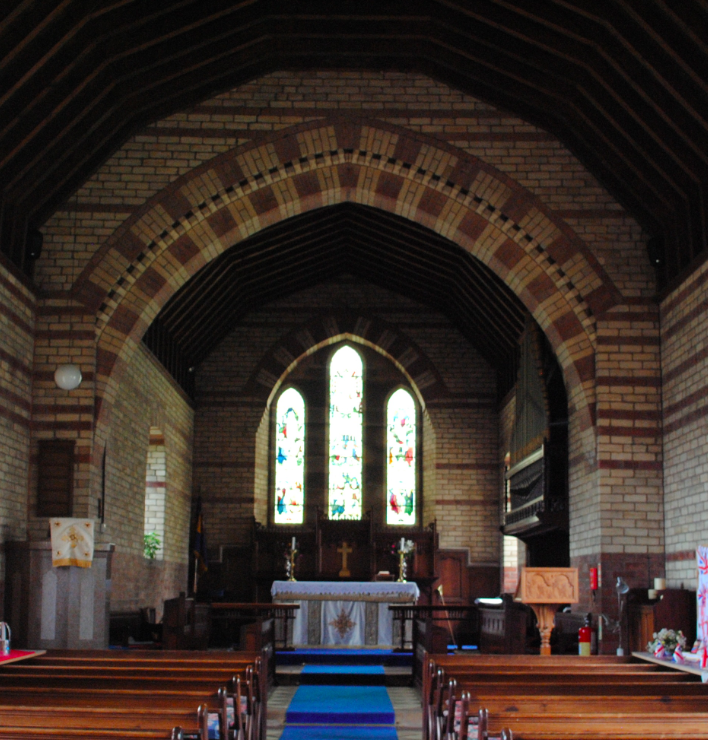 Under Canon Norman Scott, Ravenstonedale with Newbiggin on Lune was added to the parish in 1981. Shap and Bampton have since been combined and the new five parish unit is called High Westmorland. 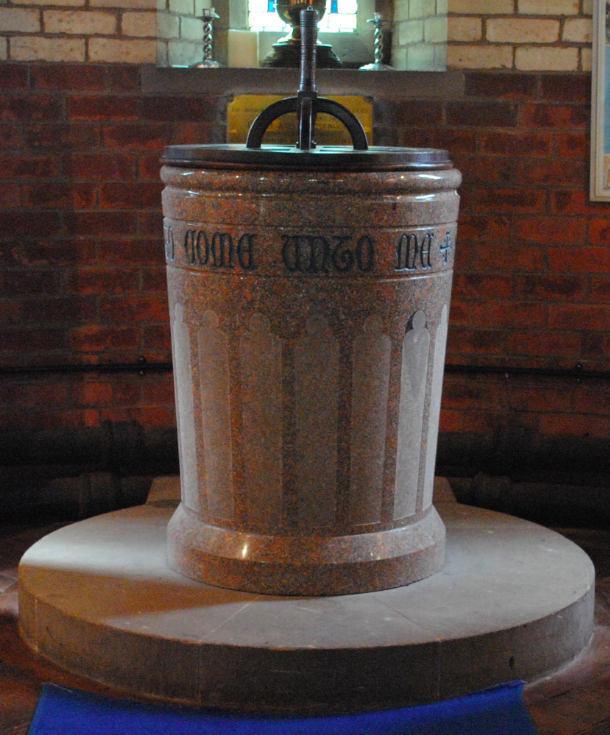 Shap granite was also used for the font (above) which is surmounted by a railway engine wheel cover. The Church of St James is Grade II Listed.